We offer online UPS to our customers, which works either on rectified mains voltage if the main power is available or on battery in the case of mains failure. 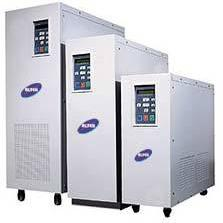 The UPS we offer is a true non break power supply. The product prevents the equipment connected to it from fluctuation, brownouts, spikes, frequency drifts, noise and many more things. The products are tested on various aspects before they are finally send at the client end. UPS System is fully Compatible to any type of Genset.